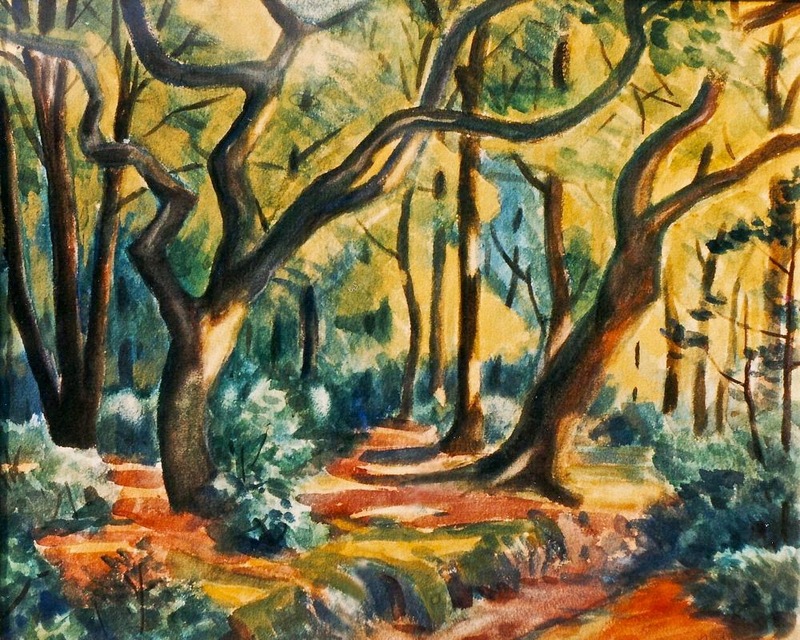 A favourite painting by Jan Gordon is of a sun-dappled forest. The picture hung on my bedroom wall as a youth. W.D.A. Smith had admired the painting on the wall of a room off his father's surgery and received it as a gift for his 21st birthday. It can be seen here in the Leeds house during the 1960s. It seems very likely that the painting shows Savernake Forest near Marlborough and there is a picture "IN SAVERNAKE FOREST" in "Three Lands on Three Wheels" (1932). Today I found two more small portrait sketches by Cora J. Gordon. They were drawn in pencil on the backing card used to frame an etching. This lady, with hair tied back is looking down, apparently focused intently on something. This lady has a similar pose, but very different features. The backing card was made by "F.H. Barton, Artists' Colourman, Print Seller & Frame Maker" of Bristol. Having rescued these drawings from their obscurity behind the Spanish etchings I'm going to place them in frames and hang them on the wall. Reframing etchings by Jan Gordon (illustrations of their second Spanish journey) I found a couple of sketches by Cora Gordon on the backing cards. These show a very different style from that of Jan Gordon's sketch for the Ashley Smith portrait. 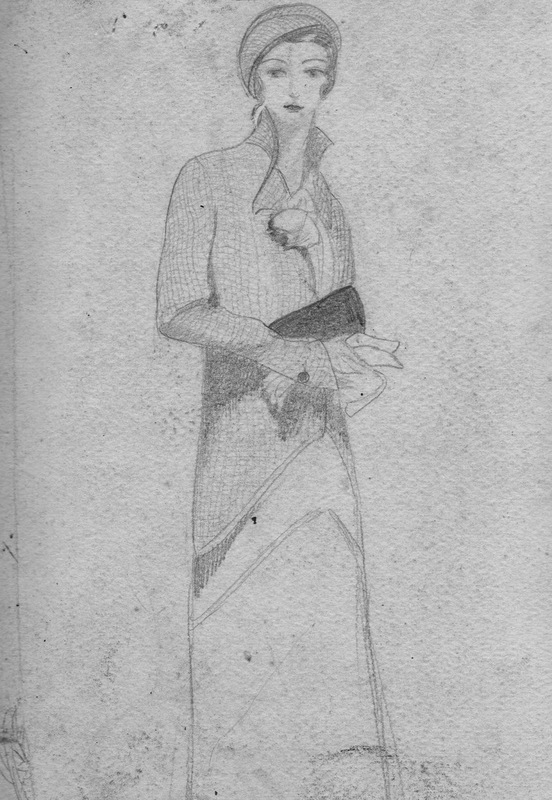 The first shows an elegant standing female figure, purse in hand. It reminds me a little of the illustration of Cora, walking in the rain with Jan as "Epicures in Indigence" in "On a Paris Roundabout" (1927). The second is of a refined female head with hat. Perhaps these are just doodles, but they almost have the feel of fashion drawings. For example, "Features from August 1929 and Spring 1930 in Britannia and Eve depicted the high modernity of late 1920s fashions in the popular illustrative style of the period, with abstracted, sharply delineated faces drawn in side or three-quarter profiles. Shoulders were square, figures were long and slim with few curves." (Buckley & Fawcett 2002). It's always fun to see the sketches made by an artist before producing a finished portrait. 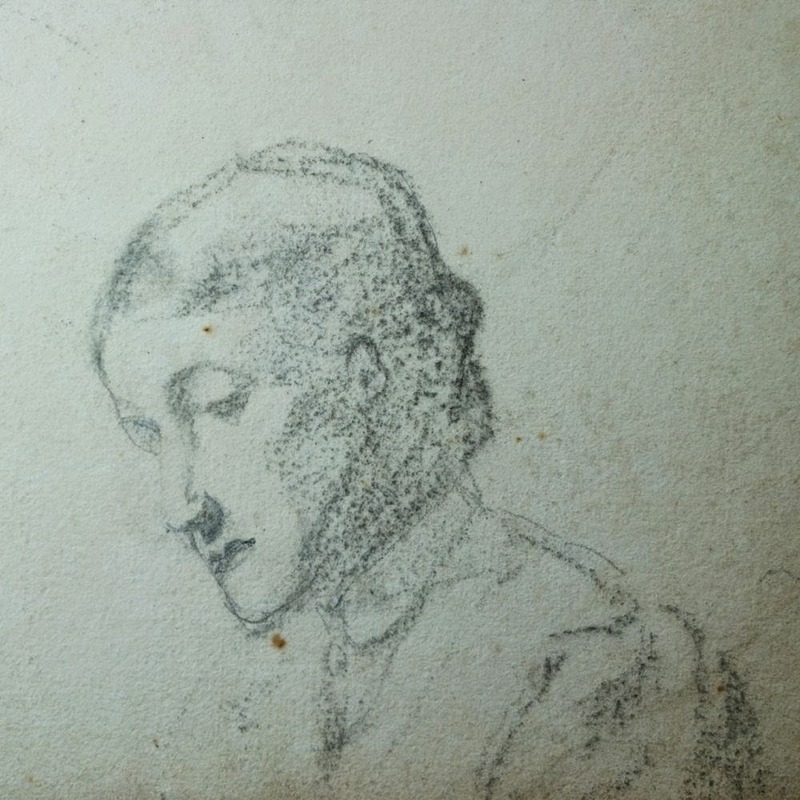 I found the following sketch in the backing of a framed etching by Jan Gordon. 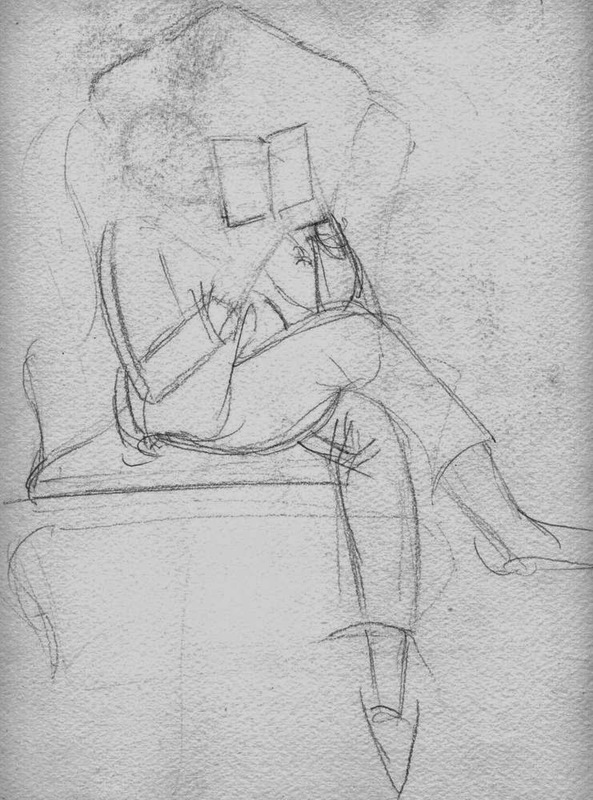 It shows Ashley Smith (my grandfather) sitting in a chair in his London home, cross-legged, reading a book. The chair is shown face on, with Ashley Smith swivelled to his left. Few lines are used. In the finished portrait, Ashley is shown from his left, leaning forward to read the book, cigarette in mouth. One of the chair's clawed wooden front feet can be seen together with the chair's green upholstery. The corner of an old Persian rug is visible just in front of Ashley's well-polished shoes. The chair in the picture still survives in the family, now upholstered in red, as it has been as far back as I can remember. "Excluding the tunnel, our best room was papered a fine deep blue. In this we had an old table, two chairs - one a wedding-present, the other senile - an easel, and an upturned picture-case as a model throne. We had tried in vain to find an orange cat to contrast harmoniously with our blue walls, but failing this we found a huge yellow Chinese vase." 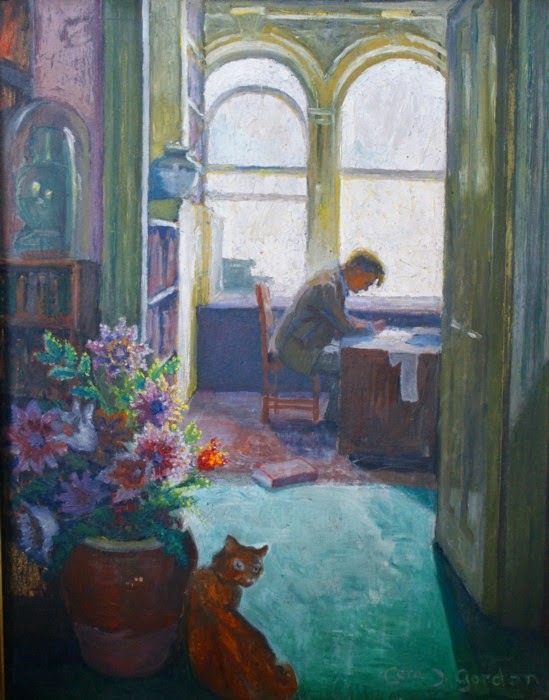 How delightful, then, this painting by Cora Gordon in which she places the dreamt-of harmonious orange cat next to a vase of flowers in the foreground, looking back over its shoulders at the viewer. The handwriting of those long gone can provide an evocative connection with their times. See for example this copy of "Two Vagabonds in Spain" with the signature of Lady Ottoline Morrell, or this signed copy of "Good Meals for Hard Times" by Doris I. Smith. A copy of "A Step-ladder to Painting" has the signatures of four generations of Smiths. 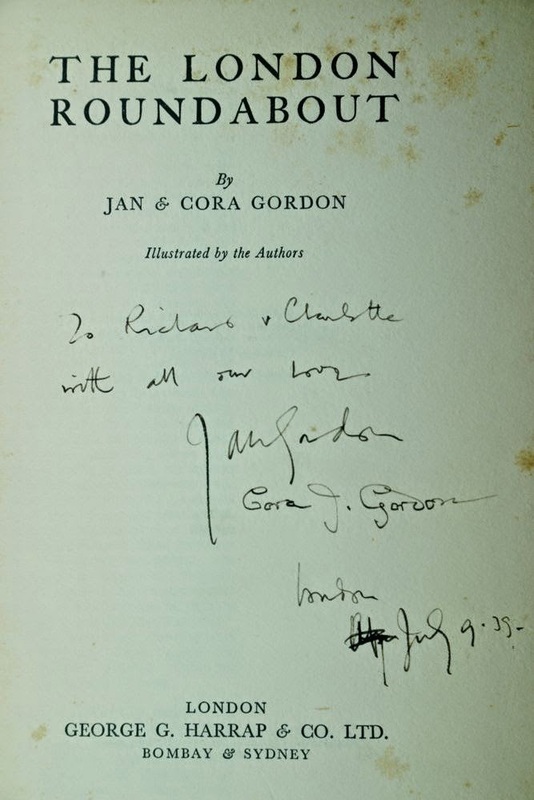 I have one copy of "The London Roundabout" by Jan and Cora Gordon with a dedication written in ink on the title page. It reads, "To Richard & Charlotte with all our love Jan Gordon Cora J. Gordon London July 9. 35." One of the Jan Gordon pictures on my wall shows an intriguing group of three short gentlemen surrounding a lady on a donkey. The story behind this scene is told in "Misadventures with a Donkey in Spain"
On the second of the two Spanish journeys made by Jan and Cora Gordon the Gordons were making their way from Almeria towards the Sierra Nevada and Granada when they came across "a rapid torrent, pouring across the road. "After being warned about the danger of attempting a crossing they settled down to wait for the flood to diminish, "but time went by heavily." "When we got up to experiment with the flood, we perceived on the far side of the road a family of boys surrounding a girl mounted on a donkey ......... The boys entered the torrent at a point .... They came towards us." 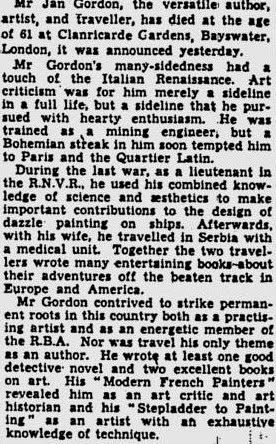 Jan and Cora Gordon: "A pair of joyous and resourceful travellers"
“A partnership that brought enjoyment to readers in all the English-speaking countries is broken by the death of Jan Gordon, which we recorded yesterday. He and his wife were a pair of joyous and resourceful travellers, and they could make a delightful book out of any journey. They shared the writing and both were artists. They preferred an unspoilt land, simple folk, and what the average tourist would call hardship.